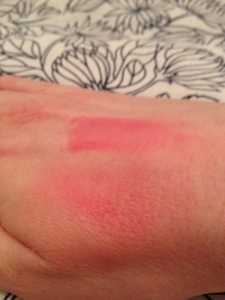 Prime Time is the first Topshop blusher I've tried. I've always eyed them up when browsing their massive nail polish selection, and after much deliberation, decided to give one a go. 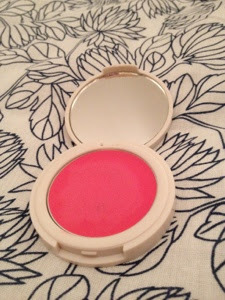 A hot pink colour in the compact, this blends out to a lovely soft pink. I was rather scared of the colour when I first saw it, but with a light touch, it looks really natural. A cream blusher with a powder finish, it's easy to apply and blend. A little goes a very long way, so I use sparingly, building up as needed. It lasts a good 7/8 hours before needing a little touch up. 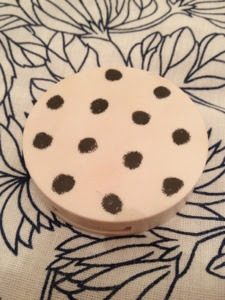 I use my fingers to dot this on and blend out, but it will also work well with a stippling brush, and the creamy texture makes blending a dream. The packaging is really cute. It feels very sturdy and has a mirror in the compact to make application easy on the go. I think Topshop's makeup range is such excellent value. This retails at £6, and will last for months, even with everyday use. Have you tried any Topshop blushers before? This looks really pretty! The colour in the compact looks a little frightening though! I've not tried any of the make up from Topshop yet. I think Topshop make some excellent makeup - for the price it's fantastic! Ooh...i like the sound of Nutmeg. It's great, isn't it - their packaging just feels nice to hold. This looks like such a pretty colour! Love Topshop makeup especially their nail polishes! I love the nail polishes too - so many colours to choose from! I only have one of their lipsticks, but love it. I think i need to try some more! I have Neon Rose and Flush and I love them a lot. Prime Time looks really pretty and bold! I have the same duvet cover as you btw. It's fantastic - i've not tried a bad product from them yet.